Last year we had the kids color individualized programs that I created HERE then we gave them to the clerk who makes the copies and he had the inside all printed after they were colored. It ended up being a little bit of a hassle on a few accounts: the kids wrinkled the programs as they were coloring so they ended up jamming the printer several times (so sorry!) and it was just a lot of effort to get them ALL colored. 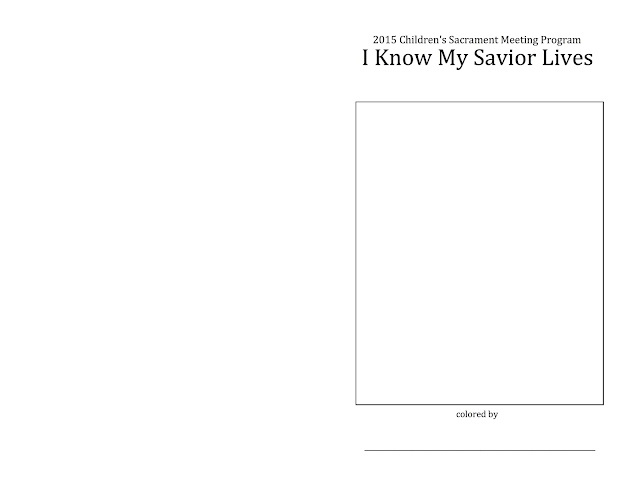 So I tailored it a little bit this year to hopefully make the program still customized but not quite so much work! I'm going to have an original copy available at primary over the next few weeks for all the kids to sign their names on that backpage (this way I can make sure I get all the kids to sign it). If space is limited it can trickle on to the front but I'd like to have it stay on the back (just my weird OCD-ness coming out I suppose). 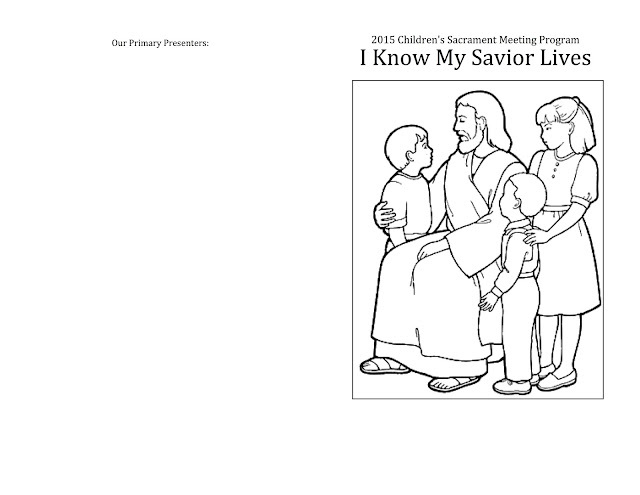 I can't take credit for the idea - a grandpa in my ward handed me a program from one of his grandkids' programs to show me this idea and they had a program signed by all the primary! So thank you to whoever came up with this great idea!! 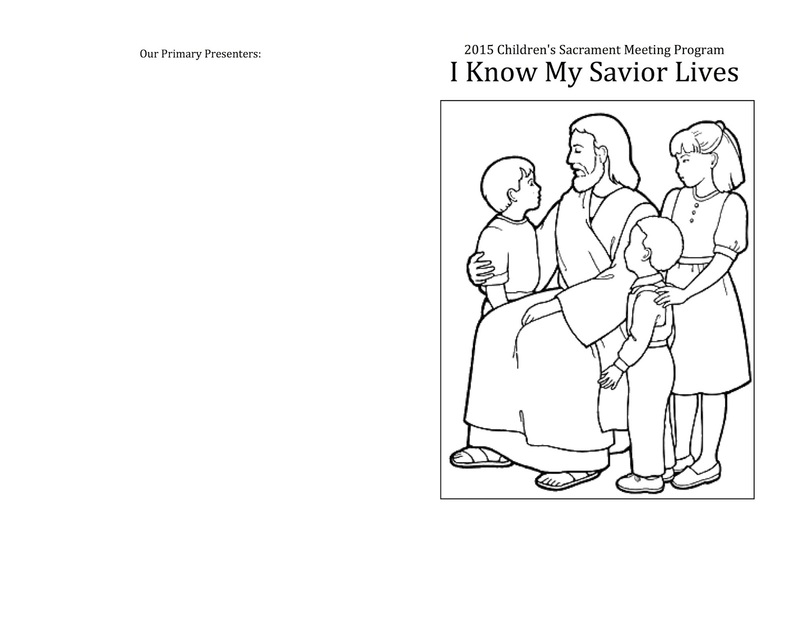 I do have our ward name and the date printed right under the picture of Christ but I didn't want it blasted all over the Inernet so it's blank here - sorry I cannot create editable documents in my program I use to create these. You can just leave it blank if you like. But if you want to do a LITERAL cut and paste, I used the Cambria font, size 25 and put it on 2 lines and centered it in that bottom space below the picture. Cut out your typed up document of your ward's name and date and tape it in place. When you make copies, you'll never know it's 2 papers taped together! 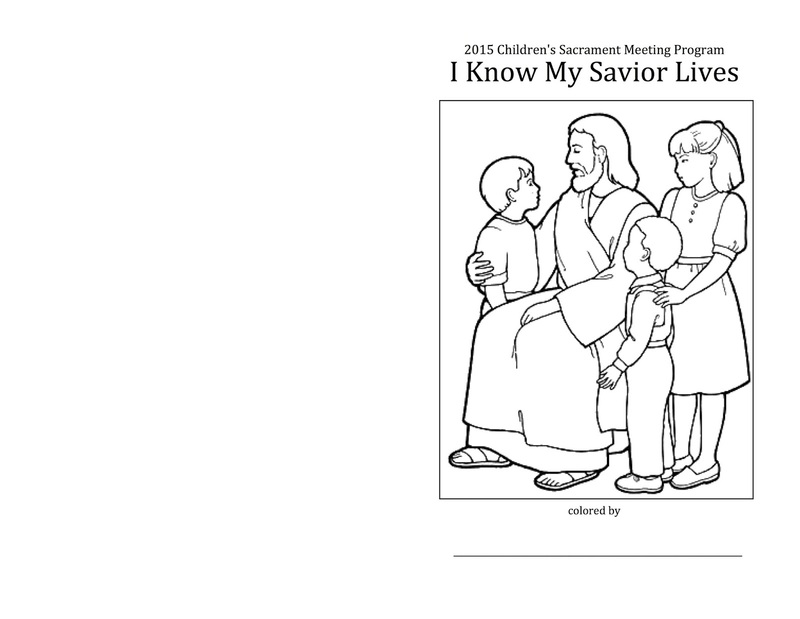 When you have the kids color these, DO NOT USE CRAYONS if you will be running them through the printer again. The wax jams the machine. Use colored pencils. 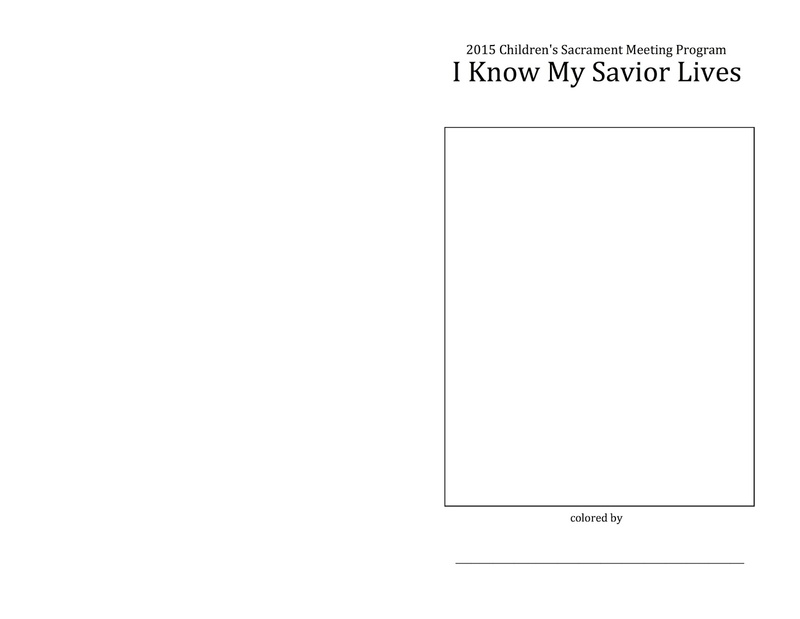 OR what I would suggest if you use these is to see if you can get the programs completely printed (inside and all!) before the kids get to color them. That way you can use crayon and they can get crinkled with no problem :). It would just take some serious coordinating with whoever does your programs. I have baskets placed at the back of both doors and members can place the filled out documents there as they leave the meeting. 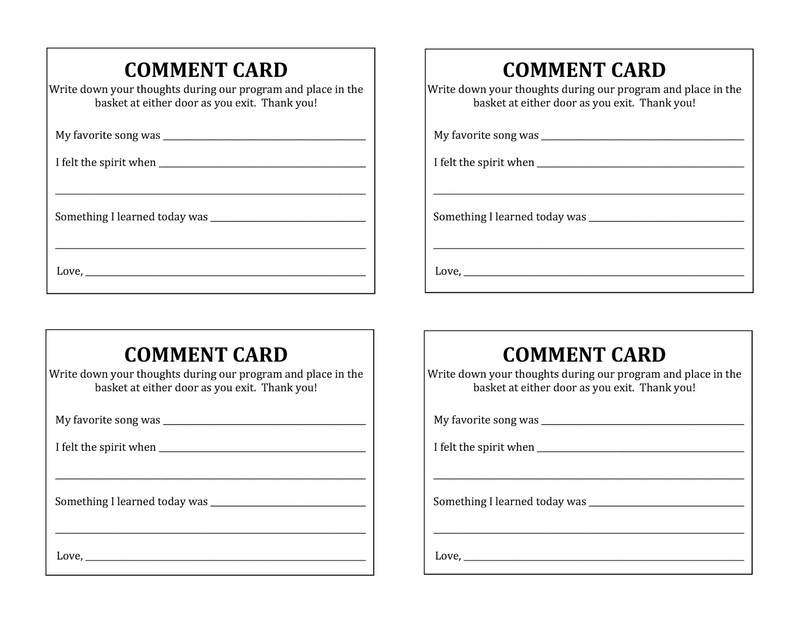 I have asked the Bishopric to announce how to use these when they turn the time over to the primary as well. Then in Primary right after the program, we read the comments to the primary. I'll probably read a few in between the songs we sing to break it up. It really is fun to hear what the congregation had to say! So if you are still with me, you can access all these documents HERE. 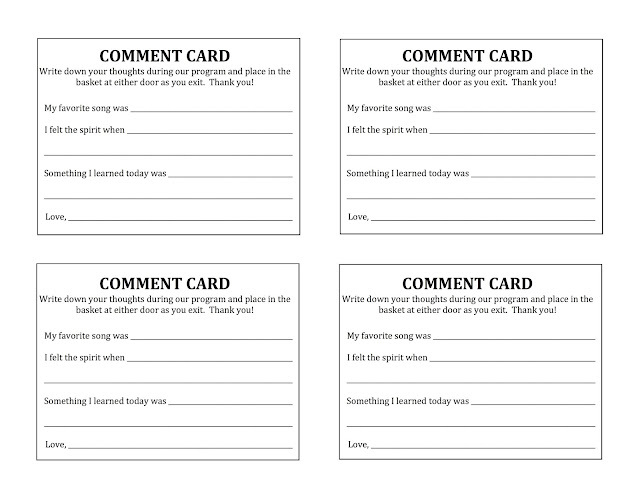 Print off what you need/want as you most likely won't be using them all :).